Tonight I had the pleasure of going to a Pecha Kucha event. It was my first, and I was plesantly surprised at the depth of subjects presented. "Each presenter is allowed 20 images, each shown for 20 seconds each - giving 6 minutes 40 seconds of fame before the next presenter is up. This keeps presentations concise, the interest level up, and gives more people the chance to show." There were presentations by architects, designers, artists, and maybe even a sociologist (at least she spoke with great precision on social dimensions of urban planning & renewal). Unfortunately, I left my handy notebook at home & was not able to take notes. However, I really enjoyed how each presenter brought their own unique vision to thinking about art, society, business, and various types relationships. All of the speakers made an impression on me. However, the two that seem to have stuck in my mind were an architect & a photographer (Rainer). The architect took construction paper to build his presentation. He was able to drive home how the physical act of positive creation can & should be shared. The photographer I had met just a few days before for my company's bio headshots. He specifically seeks out locations & cultures that would take him out of his comfort zone. Even more interesting, he chooses shoots on places/cultures/etc. that he really has no true foreknowledge of, and he specifically avoides researching the shoot. His presentation focused on Nazarenos (penitents) during Holy Week in Spain. In his presentation, he really drove home the fact that there is so much in the world that we Americans typically do not have a clue about or pay attention to. The Nazarenos date back to the 15th century. Yet, I'd never heard about them until his presentation. For images, check out my Flickr set. 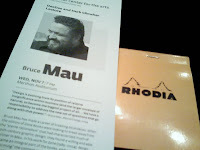 I had the pleasure of listening to Bruce Mau speak last night at OSU's Mershon Auditorium. Mau has a great ability to facilitate collaboration among peers & students to create massive change. He currently heads up Institute Without Boundaries as well as the Bruce Mau Design firm. Before I get into the details of the lecture, I just wanted to highlight the two takeaways that I received. First, that when we talk about physical objects we're really talking about energy--the energy need to produce, the energy needed to transform, etc. So that we have a system of inputs & outputs of energy. Mau sprinkled this idea throughout his lecture. He illustrated this when one participant asked about biomimicry. He described how we as humans must put a lot of energy into making glass. Yet, some animals can produce glass a room temperature. The second takeaway was that systems of information should be systems of design. He highlighted how the spirit of the Gautamalans has been depressed because they are not sharing the good works their fellow citizens are doing. Thus, overall, hope has been diminished. Mau has then helped Gautamala create a system which distributes information across the nation. Now, that could easily become propaganda. However, it demonstrates how information architecture including the architecture of the information channels are very important in a socio-political context. Here are some of the quick notes that I took during the lecture. *Note: Mau reports the Chicago has a serious water shortage problem. They are not allowed to tap into the lakes per the Supreme Court, and they will run out of water if they continue to tap their aquifers in about 25-30 years. "Designers don't have the luxury of cynacism." Instead, they should be committed to accomplishment. "We don't need to complain. We need an IDEA." Take out "human life" and replace it with "all life"